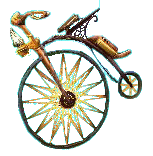 Enter for your chance to win a Pennyfarthing 7-day Rental Mount + 1,000 Crowns. We’ll be giving away 2 codes each day on Tuesday to Friday. Our Contest Day begins at 6:30pm eastern – and will close at 6pm each night until Friday 07/12! plying the Skyways in their canoes. There are two bands of Water Mole tribes.